Our Commercial Gym Upholstery Foam Rollers are manufactured by us and TRULY ARE HEAVY DUTY! 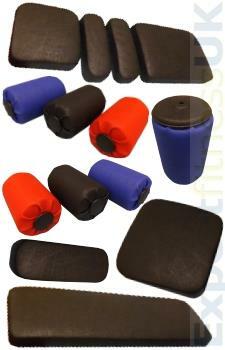 They are available in a choice of Size and Colour and will outlast ALL types of Molded Foam Rollers. Our Ready Made Gym Upholstery Rollers are available in various sizes. During manufacture we use thick Fire Retardant Wood covered in an industry standard Reconstituted Foam for years of use. The Gym Foam Roller pad is then covered with one of our many colour Upholstery Vinyls specially formulated for the fitness industry. We offer a choice of side covers that can be used to cover both the inside and outside of the Roller Pad for that finishing touch. Our In-House Upholsterers have worked with Gym Upholstery Vinyl for over 30 years providing Upholstery and Repair services within the Fitness Industry, Contract Upholstery, Physio Therapy and Medical Industries. Our Gym Upholstery is fully Fire Retardant to Crib-5 with Anti-Bacterial protection to protect against harmful bacteria including MRSA and is treated with a Stain Erase coating to increase resistance to everyday staining.